I’m feeling really peaceful, sitting here drinking my coffee and enjoying some quiet space this morning. It is a top priority to have this “intentional time” for myself. It allows me to set the tone for the day and to fill my cup (literally and figuratively—cause #coffeeislife). It got me thinking about HOW we can create this space for ourselves. How, with all the “business” of life, do we carve this time out? As I looked around my home this morning, pondering this thought, one thing became clear. I was, for the moment, not stressed about the “state” of my home! The dishes were done, floors were clean, toys were put away, and things were mostly in their place. Hence, the peaceful start today! 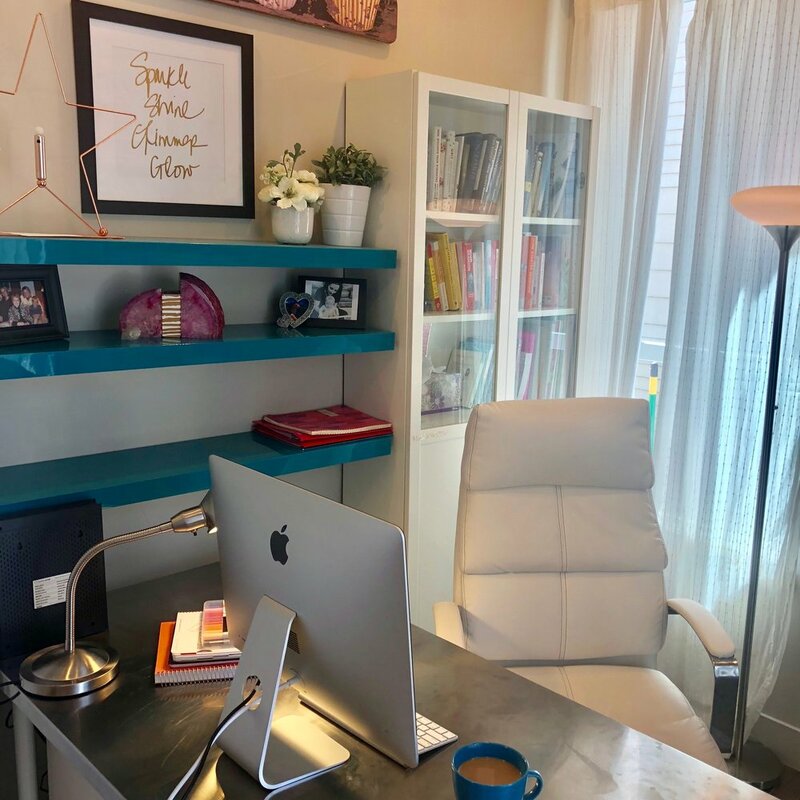 Now, I am someone who is highly affected by the space I am in, so it’s natural that when things feel super-cluttered and out of place, I can’t relax. Are you the same? So this got me thinking - what have I been doing lately that creates this space for me to “just be” in my home instead of constantly cleaning up? What mini-practices and routines have I put in place that are simple to complete every day and leave me with a sense of order and accomplishment? So today, that’s what I want to talk to you about - Daily and Weekly routines!!! If that didn’t elicit a reaction from you of total excitement, know that’s ok - lol. What I want to communicate is a MINDSET SHIFT. If one lesson remains with you today, I want you to know this: structure give you freedom. I know that sounds strange, but hear me out. When you have routines and live with a little more organization, it takes out the guess work. You alleviate that horrible feeling that there is always something to do or work on, but not knowing WHEN (or how) you will get it done. by building in some simple daily and weekly routines around your household chores, you take out the unknown and replace it with certainty. There is freedom in NOT having the choice - you KNOW it will get done, and you don’t have to take up precious energy to worry so much about your home. Also - disclaimer! This has proven to work for me right now, in this season of my life. By no means do I give you these examples as hard and fast rules. You know your home, your own cleaning style, and your own family. Take a tip or two that motivates or excites you and chuck the rest. There is no one right way to do this. Before we get into the nitty gritty, I want to offer this helpful hint: When you have less stuff in your home, all of the cleaning and tidying up becomes simpler. If you find you are shuffling things around from room to room or shoving them in bins as a temporary bandaid, you might have too much stuff - and you might never feel like your home is clean. So my recommendation is to set some time aside (kid free maybe!) to start paring down! However, if you think you have a clutter problem and can’t face that today, don’t let it stop you from starting these mini-routines. Let go of perfection and just start. Ok, here we go! Unload the dishwasher first thing in the morning. No matter how full it is by evening, we run the dishwasher so that we don’t have to do a mid-day load and unload tomorrow. That mid-day load always means the dishes get backed up while we are waiting for it to finish, and then at dinner time we are left with a giant mess. By running it nightly and unloading in the morning, there is no excuse for where the day’s dishes go. As soon as we are done eating, we pop them right in the dishwasher. Start a load of laundry. Yes! You heard me right, most days we do a load of laundry. Hear me out. It might sound like more work, but for us, it is just a small amount of work each day. I used to DREAD doing five loads of laundry in one day (when we used to do it once a week). Inevitably, we would forget to move a load (or two) when it was done from the washer to the dryer, it took a thousand hours to fold, and just never seemed to get finished. So now, we go around the house and grab everything (baby clothes, our clothes, and any random things that need washing) and throw them in a quick wash cycle on warm. At some point throughout the day, we make it a point to move them to the dryer, fold them, AND get them put away. I feel like my stress level around laundry has gone down significantly because of this daily practice! Do the dishes and countertops after every meal. When you let dishes pile up in the sink, it can really add up. After each meal, we wash or load the dishes into the dishwasher and quickly wipe down the table, highchair, and counters so we can start the next meal with a fresh and clean kitchen. We don’t necessarily use cleaning spray or anything fancy, just a quick wipe down with water and a cloth on all surfaces. This will also prevent your counters from accumulating sticky messes that are hard to wipe clean once they have dried. Floors! Every night (at 1am!) our Robot Vacuum runs. In the beginning, I resisted the Roomba purchase. My mom has two (named Molly and Mason, one for each floor) and she was always recommending it to me, but I was not initially interested. Once Hazel began throwing food at every meal (and we were CONSTANTLY sweeping), we decided it was time to try a Roomba - and we have never looked back. Now, throughout the day, I no longer stress about the floors (I even wipe crumbs onto the floor) because I know the Roomba will get it all overnight. With light color hardwood floors that show a lot of stuff, I used to feel I was sweeping non-stop. Using a Roomba now has probably saved me 20 minutes a day. Nap-time pickup! This has been key for us lately. First off, we are trying to teach Hazel to put away her toys. Before she goes down for her nap each day, we do a mini clean up - and include her! Once she is down, we make sure all the dishes from lunch are away, toys are back in their place, and we head upstairs to fold that load of laundry we started in the morning. Naptime provides us a mid-day reset so we can chill and address dinner feeling relaxed. EXTRA CREDIT: If you are in a decluttering phase, you can dedicate just 5 -10 minutes working on a small project. Maybe it’s cleaning out your junk drawer, or a small coat closet, or a wrapping paper cabinet. Small progress adds up! It’s less overwhelming to work on one small, manageable thing at a time. Here is what we (mostly) do weekly. Honestly, I think the main point here is that if you do a little bit everyday, you can do about 30 - 45 minutes of actual cleaning on the weekends. Or just call it good - ‘cause things are mostly clean! If you normally wait all week to do anything, you are left with a GIANT cleaning day on Saturday. But the “little bit everyday routine” will free up that Saturday time to go do something more fun! Identify 3 areas that bother you, focus on those, and forget the rest. For me, it was the floors. They always bugged me, so the Roomba was a good solution. My husband is the dish man, because dishes bother him the most. Know that small progress really does add up. We are not aiming for perfection here, we are aiming for simplicity and whatever amount of cleaning makes you feel good. SUPER IMPORTANT: You are not a better or more perfect mom if your home looks perfect, and you are not a bad mom if it’s messy. Everyone has a personal level of what feels good. For me, having things tidy frees up brain space and actually helps me be more present with my family. But the caveat is that sometimes I become so obsessed with tidying, I miss moments. I know I will always be striving for harmony of keeping things nice AND being a present and intentional mom. Each of us will continue to strive for that balance. I help moms get healthy body and soul so they can be the mom and human they are meant to be! Snag my free Grocery List For busy moms who want to get healthy. Want more inspiration for simplified Motherhood? Subscribe below!